You can pick from a huge selection of treats for your dog, or you can give them one that they’ll love, that also happens to clean their teeth. Talk to any vet, and ask them which treats you should be feeding their dog, and you’re going to hear the word “Greenies” time, and time again. #1 Vet Recommended Dental Chew For Dogs: It’s no secret that veterinarians around the world recommend Greenies to their clients. They’re perfect for at-home oral care because your dog will love the great flavor, and the consistency works to break down harmful enzymes that build up on your dog’s teeth. Treats Bad Breath And Cleans Teeth: The last time your dog got into your face wanting some sweet, sweet loving, what was the first thought that came to mind? It wasn’t about how good their breath smelled, was it? 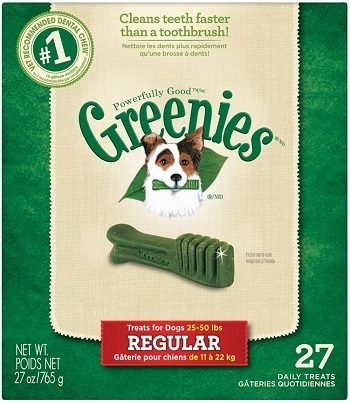 With Greenies treats, though, you won’t notice their bad breath, because the treats help fight off the bacteria that causes bad breath, and removes plaque and tartar build up from their teeth. Breaks Down Quickly For Easy Digestion: While the treats may appear to be solid, they actually break down fairly well. As your dog begins chewing, the Greenies break down into smaller chunks which helps aid in digestion, and clean out your dog’s internal systems. Added Vitamins And Minerals: The low-fat treats are packed full of extra vitamins and minerals, to not only help freshen their breath and clean their teeth, but make up for any nutrients that they may not be able to get from their dog food. Comes Out Looking Like They Went In: One of the biggest problems you’ll notice with Greenies is that the way they go into your dog’s mouth, is the same way they’ll look coming out. It can be a bit unsettling the first time you see it, but isn’t really something you have to worry about. The treats are safe for your dog to eat. Check Your Order’s Expiration Date: Some customers have reported that the bag of Greenies they received was actually expired. While ordering from Amazon is incredibly efficient, and lets you save the most money, there are a few unscrupulous sellers that will pass off expired products in an effort to make some money. If this happens to you, ask for a refund and order from a different seller on Amazon. Give Your Dog Plenty Of Water: The solid style of the Greenies treats means that you need to ensure your dog has plenty of water to help with digestion. Some customers have reported their dogs becoming constipated after eating Greenies on a daily basis for a couple weeks. Greenies have been around for a long time, with millions, upon millions of happy pet owners giving them to their dog on a daily basis. If you’re looking for a treat that won’t make your dog fat, while also cleaning their teeth, and freshening their breath, Greenies are an excellent choice. There are more reasons that pet owners around the world love giving their dogs Greenie treats. To see a few of them, click on the button below.